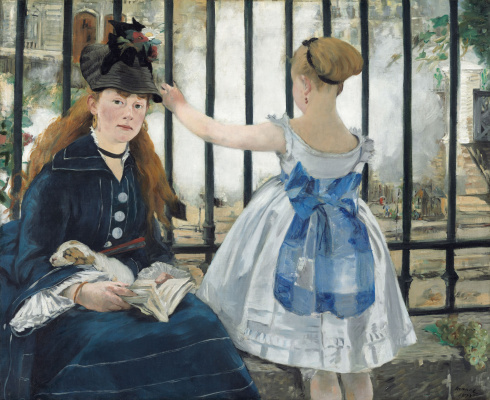 Russian museums hold only a few paintings by Edouard Manet. One can count them on one hand. “The Bar” canvas probably is one of the most precious and significant among them. 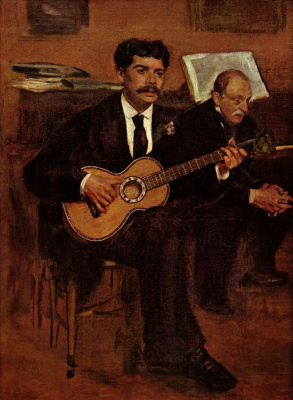 The main Russian collectors Sergei Shchukin and Ivan Morozov have got interested in the French art when Edouard Manet was already dead. 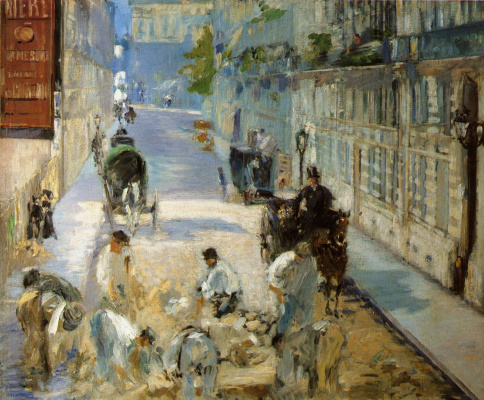 After the death of the artist, all his paintings were auctioned off at the Hôtel Drouot and spread to private collections and galleries of art-dealers. 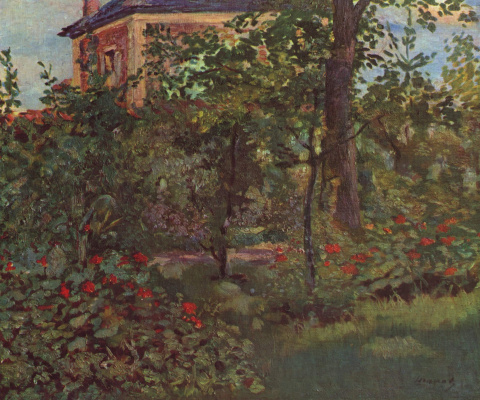 Some of them were bought back by Monet’s wife and son, others – by old admirers and friends. 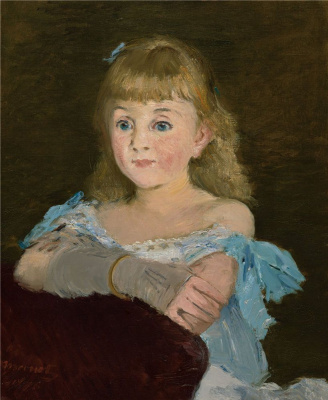 When Russian collectors got to the French art, Manet has already become a classic. His “Olympia” and “The Luncheon on the Grass” prepared to move to the Louvre. «The Bar» is one of the late bold paintings of café scenes executed by Manet a la prima from real life. 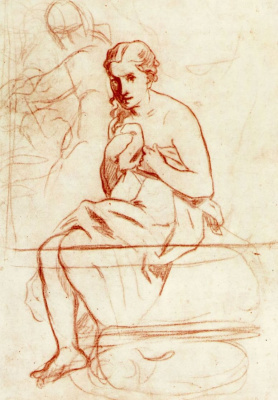 It’s a study for an unmaterialized painting. It’s a brilliant sketch made in thick long brushstrokes requiring no further processing which demonstrates a new manner of Manet. He was still dreaming about the Salon and The Legion of Honour but he has already felt that he should not sacrifice his way of seeing. In 1878, he was watching customers at café chantants, cabarets, and bars at the bottom of the Montmartre hill. There were bored prostitutes waiting for their clients, tired men watching the scene dancers from their tables, pensive women forgetting about their smoldering cigarettes, and waiters carrying beer glasses (by the way, it was a recent novelty in Paris approved only by a few places at the time). 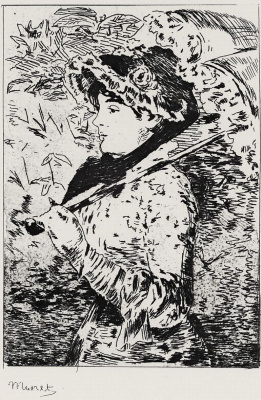 Art critics provided a tart response to Manet work. 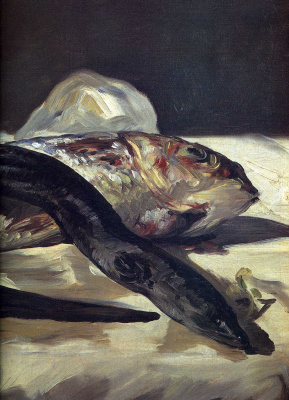 They said he was very good with still lifes and that was the reason why he put them at every opportunity, without rhyme or reason everywhere – in genre scenes and portraits, with no concern for culinary fineness and combination of products. All he’s ever cared about was how these elements matched in color and how the light hit the glass. And, yes, he was doing increasingly better with his still lifes, even if they composed of a pair of bottles and they, in their turn, were made of a pair of shades of the same color. 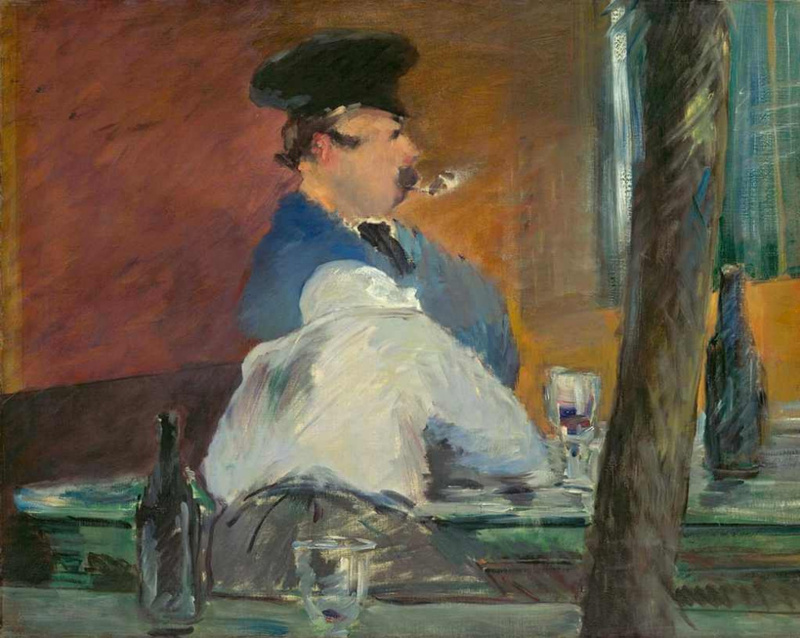 A glass executed in five brushstrokes in the foreground of “The Bar” standing in front of a man that bents over, is much more daring than Renoir’s glasses in the “Luncheon of the Boating Party” and Degas’ glass in the “Absinthe”. 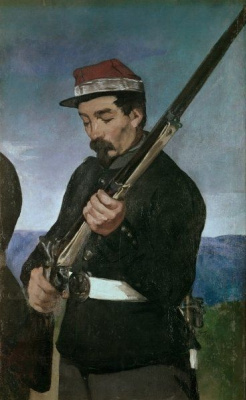 Manet uses a tree trunk to cut the composition of “The Bar” from top to bottom in a very Japanese style. Inspired by the Ukyo-e woodcut prints, the same trick was used by Degas in his horserace paintings to make an effect of an image captured accidentally, like a momentary shot. However, Manet uses the spatial distortion and frontal impact for another purpose: he brings the viewer closer to the man sitting at the table and literally pulls us into the space of the canvas. 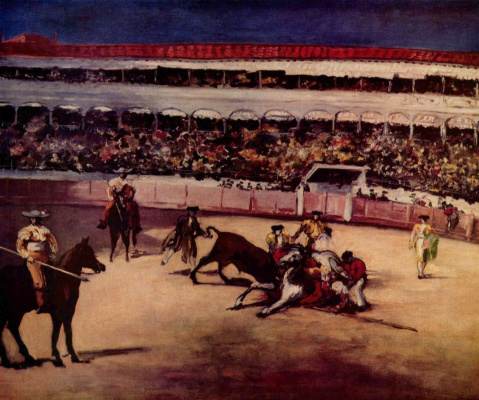 In three years Manet would get the medal from the Salon, and with it, he obtained the long-awaited right to show his paintings at the main exhibition of Paris hors concours. At that moment, the artist who has changed the French art of the late 19th century and the art of the Salon, turned almost 50 years old.